Export-oriented new member countries of the European Union and the spread of trade protectionism. The consequences of trade protectionism, following the 1929-33 global crisis, are well known. Politicians did learn this lesson at times when they did not react to the global financial and economic crisis in 2008 with widespread and national/regional protectionism. They did understand that any breakdown in terms of high-level interdependence would lead to unpredictable consequences. International trade, although it suffered a double-digit recession in one year, was therefore able to remain a key pillar of stabilization and recovery.2 In the European Union, GDP decline by 4.5 per cent in 2008 was accompanied by an 18 percent fall in trade. Trade returned, however, to the pre-crisis level as early as 2010, several years before the EU average GDP reached this stage. Moreover, ten years of continuous growth, a rare case in modern economic history, was largely driven by rapidly increasing and deepening economic interdependence both on the level of member countries and in the framework of rapid spreading and qualitative upgrading of global value chains. Global economic trends can hardly therefore explain why protectionism is once again with us, just at the peak of the economic growth cycle and preceding expected slowdown. It was the Trump administration that, based on the “America first” view of the world, decided to initiate a frontal attack on international trade in general and against “evil countries” with a huge surplus in bilateral trade with the United States (mainly China and the EU with Germany in particular). As a first step, tariffs of 25 and 10 per cent were introduced for steel and aluminum products, first against China and some other countries, and with a small delay, as of June 2018, also in trade with the European Union, Canada and Mexico. This policy was followed and reached serious dimensions by the introduction of punitive tariffs on 1,333 Chinese products with a value of about USD 60bn. Without any delay, China retaliated with a list of more than 100 products imported from the USA worth approximately USD 50bn. Escalation of the trade war, impacting the transatlantic economy, cannot be excluded either. Global economic trends can hardly therefore explain why protectionism is once again with us, just at the peak of the economic growth cycle and preceding expected slowdown. The USA is starting to feel the negative impact of the protectionist policy. First, higher import prices or even higher prices of import substitutions by domestic production had the greatest impact on lower income groups and the relative or absolute losers of globalization, both decisive supporters of the Trump electoral campaign. Second, several commodities, facing higher tariffs and other restrictions, have been produced by US companies settled in various countries offering lower production costs. Thus, US companies can also be identified among the losers. Third, Chinese retaliatory countermeasures have already caused substantial loss to US farmers and generated a USD 12bn subsidy package negatively affecting the already shaky US budget. Last but not least, trade protectionism diverted attention from a much more serious problem, namely the rapid increase in Chinese interest and investments in, and many times illegal access to, American and European high-tech achievements. EU-28 exports revealed a continuously growing share in EU-28 GDP over the last decade. Although the export/GDP share of 39 per cent in 2008 fell to less than 35% as a result of the nancial crisis, it bounced back in 2010 and, in the following years reported a constant rise up to 45.8 per cent in 2017. In other words, the international involvement of the EU has been steadily growing, both due to rapidly growing exports to extra-EU emerging markets and to the long recovery and growth period within the EU and the Eurozone. Although almost all member countries, except for Finland and Sweden, followed the overall path of growing export-orientation, a basic driver of overall economic growth, differences in the GDP-related weight of export-orientation remained very strong. NMS countries excel by the highest export-orientation even in a global ranking. With the exception of the special cases of Luxembourg and Malta, Ireland leads this list with 120 percent of export/GDP ratio, followed by Slovakia (96%), Hungary (90%), Slovenia (82%), and the Czech Republic (79%). Even the less developed and previously less export-oriented new member countries register a higher than EU-average export/GDP ratio (Bulgaria 66%, Croatia 51%), with only Romania remaining below the EU average (41%). Higher import prices or even higher prices of import substitutions by domestic production had the greatest impact on lower income groups and the relative or absolute losers of globalization. In contrast, the export-exposure of all large EU member states (France, Italy, Spain, United Kingdom) remains in the range of 30-34 per cent, with the exception of leading and highly export-oriented Germany with 47%, a bit over the EU-28 average. Interestingly, and in contrast to the older and larger member states, growing export-orientedness mainly resulted from a strong link to the intra-EU markets. This development is in sharp contrast to the overall EU figures that indicate a manifest opening towards third markets. Over one decade, the share of intra-EU exports in total exports of the EU-28 fell from more than two-thirds to about 62 per cent. The above average growth of extra-EU orientation can be explained by several factors, including the discovery of rapidly growing extra-EU emerging markets, dynamic commodity sectors, sustained competitiveness but also “export-pressure” imposed on certain member countries in recession in order to keep production (and employment) levels up and turn to expanding external markets at times of intra-EU recession or sluggish growth. The international involvement of the EU has been steadily growing, both due to rapidly growing exports to extra-EU emerging markets and to the long recovery and growth period within the EU and the Eurozone. The dynamics of export-orientation to intra- and extra-EU markets deserves some additional remarks. First, the crisis initiated a quick (even if partial) reorientation of exports in several member countries, without questioning the key role of intra-EU markets (with the exception of the United Kingdom and Cyprus). In less than one decade, however, the share of extra-EU exports grew by 3 to 4 percentage points for Germany, France, Italy, Spain (and by 7 percentage points for the United Kingdom). Although to a smaller extent, also some smaller and highly export-sensitive old member countries, such as Belgium, the Netherlands, Austria, Portugal or even Greece followed this trend. The development of exports from the new member countries followed a different trend. Between 2009 and 2017, the share of intra-EU trade not only remained dominant, but also stagnant, in some cases even with increasing intra-EU share, despite the already very high intra-EU levels (Bulgaria and Romania due to the accession impact of 2007, but also for Hungary). This development took place despite sometimes government-led export-reorientation initiatives. Due to their key intra-EU orientation, the NMS-7 only amount to 6.9 per cent of total extra-EU exports (with 5.2 per cent for the V-4). More than 28 percent is accounted for by Germany, followed by the United Kingdom, Italy and France, each slightly above 10 per cent. The NMS-7 share is even smaller if we consider extra-EU exports to the United States (4.1%, within it V-4 with 3.5%) or to China (4.5 and 3.5%, respectively). The crisis initiated a quick reorientation of exports in several member countries, without questioning the key role of intra-EU markets. Much more important is their presence in exports to Russia, with 17.7% (V-4 with 14.6 per cent) of total EU exports to Russia. Looking at exports to the United States, Germany is most involved with 30 per cent of total EU exports, followed by the United Kingdom (14%), Italy (11%) and France (9%). Apart from Poland (1.5%) none of the NMS-7 reaches 1 per cent of the EU exports to the USA. The combined share of the USA, China and Russia in total extra-EU exports of the NMS-7 is similar to the EU average (33.7%, but including a very high 45 % share for Slovakia), but with a different geographic distribution. While the old and larger EU countries reveal a clear preference for the US market (above 20 % for the United Kingdom, Germany and Italy), the same indicator for the new member countries is about 13 per cent for Poland, the Czech Republic and Hungary, and much less than 10 per cent for Romania, Slovenia and Bulgaria. The only exception is Slovakia with 19.3 per cent of its total extra-EU exports directed to the USA. As a consequence, the direct impact of any current or potential protectionist decisions by the Trump administration would be much more limited for the NMS-7 than for most of the other and stronger EU member countries. The figures are even more telling if we take into account the share of US-related exports in total exports of the individual countries. It accounts for 2.5 per cent for the V-4, as compared to 13% for the United Kingdom, 9% for Germany and Italy, or more than 7% for France. It should be added that the NMS-7, although all with a trade surplus with the USA, have a cumulative surplus of about Euro 5bn, or slightly more than 4 per cent of the total EU surplus of Euro 119bn. If the Trump administration wants to target high US bilateral trade deficits, it could easily find Germany (66 bn, or more than half of the total EU surplus), Italy (25 bn) or Ireland (18 bn). Another issue is that trade restrictions, once introduced, would be against the EU and not against separate member countries, even if commodity-related punitive measures could easily change the overall distribution of the impacts and consequences. Due to their unique openness, based on the limited size of the domestic market as well as in-depth participation in the international division of labor as a major source of sustainable development, catching-up, competitiveness and higher living standard, the NMS are obviously more vulnerable to any adverse development in international relations (both in security, political, financial and economic terms) than most of the other EU member countries. Their direct exposure to US trade protectionism is also limited. The indirect impacts cannot, however, be ignored. First, any trade protectionist measure to be introduced by the United States in the future against the EU, would seriously affect the position of the NMS-7 in global and European value chains in general, and, in the automotive industry, in particular. Any restriction or higher tariffs on cars exported by Germany would have an almost immediate negative impact on Central European subsidiaries, generating a substantial part of the exports of these countries. Trade protectionist measure to be introduced by the United States in the future against the EU, would seriously affect the position of the NMS-7 in global and European value chains in general. Second, the global and transatlantic spillover of US protectionism, followed by adequate countermeasures by the EU, may have unpredictable and incalculable consequences on the world economy. Such a situation could cause a significant disruption in trade and economic relations between the NMS-7 (and even more the V-4) and their key export partner, Germany. Third, foreign direct investments, a key pillar of “competitive globalization” would suffer twofold. On the one hand, already existing networks might be destroyed, while, on the other hand, general insecurity would hold back companies from establishing new subsidiaries and supplier chains abroad. Fourth, the financial implications would have to be addressed. Continuing trade protectionism would cause enormous damage to the international financial system and could lead to “competitive devaluation” with unforeseeable consequences. Fifth, beyond retaliatory instruments, the EU, as an export-oriented integration, may be forced to nd new markets in order to alleviate the losses caused by US trade policy steps. One cannot rule out the possibility that several countries punished by US protectionism would be ready to mutually open up their markets to each others’ products (including services and investments). This would generate additional extra-EU trade flows, in which the NMS, at least based on their current performance, are unlikely to be full-edged participants. Opening up of such new channels could be used through European transnational companies, further fostering intra-EU exports which will be reexported by the host countries of these companies. Continuing trade protectionism would cause enormous damage to the international financial system and could lead to “competitive devaluation” with unforeseeable consequences. 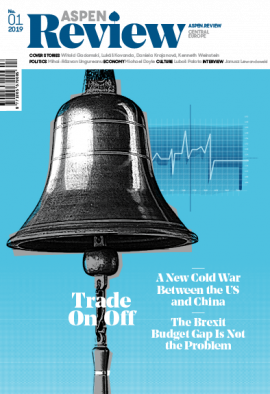 Sixth, the real threat of US trade protectionism continues to divert attention from the lasting negative impact of (recently prolonged) EU-level (and largely also by US-driven) sanctions imposed on Russia after the occupation of Crimea in 2015. NMS-7 exports to Russia are as important as those to the USA (about 14 per cent of extra-EU and 2.5 per cent of total exports). Finally, several NMS countries consider potential trade restrictions in relation with the USA less a priority than some other issues. As an example, for Poland (and probably also for Romania), the stability of NATO and its commitment to offering efficient military protection against potential Russian initiatives or concrete moves is a dominant pillar of future Polish-US relations. Recent developments also seem to indicate that the US administration has been changing its previous attitude towards the Orbán regime in Hungary. Non-trade and non-economic priorities seem to be more relevant, sometimes for external security reasons, sometimes only for the domestic “stability” of an authoritarian regime. 2. For a detailed analysis, see: András Inotai: European Integration at a Historical Crossroads. Personal Remarks on Key Challenges and Policy Options. In: Public Policy Challenges – European and Regional Dimensions. Economic Policy Institute, So a, 2017, pp. 23-43. 3. All figures in the article are from personal calculations based on Eurostat External and Intra-EU trade publications (time series from 2007 to 2017 and, if not indicated separately, the latest figures for 2017).